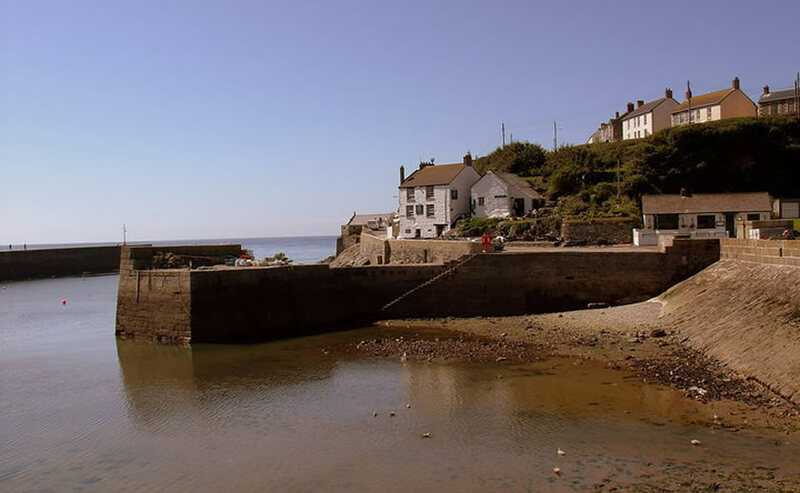 About a hundred years ago we had a couple of holidays in Cornwall, right down at the bottom, on the Helford River. 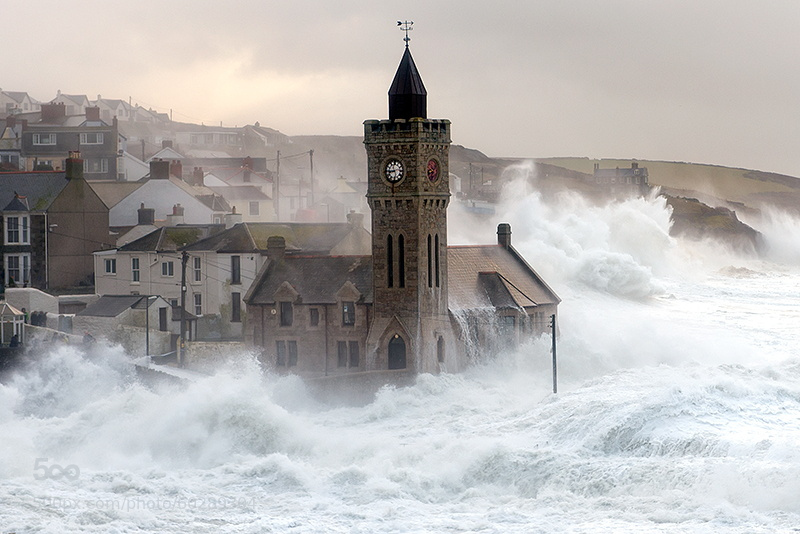 The weather was well, Cornish. Sunny [mostly], warm and with that fine mist that seems to help the exotic plants do well but wets you through and reminds you that, after all, you’re in England not France, Italy etc. Why exactly are we standing on a beach in the rain, we ask ourselves? 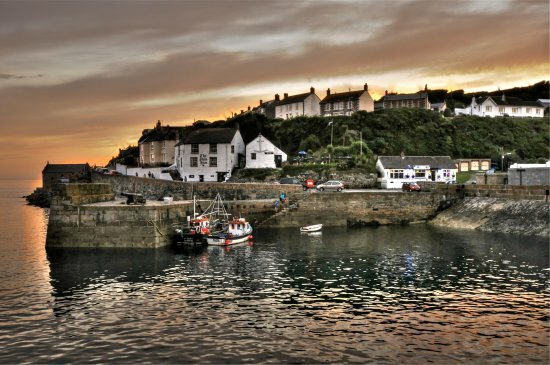 There are lots of great eating places in Cornwall [in which to shelter from the rain], interspersed with the wide variety of artists and craft shops, as well as the sailors. Never was the expression “knit your own yoghurt” so apt. Falmouth is packed out in the summer, the roads down into Cornwall nose-to-tail with cars and inevitable caravans [don’t get us going…], but in mid-March it’s largely the preserve of the locals and the smart, expensive sailing clothing shops nestle uncomfortably alongside charity shops, Poundland and Greggs. 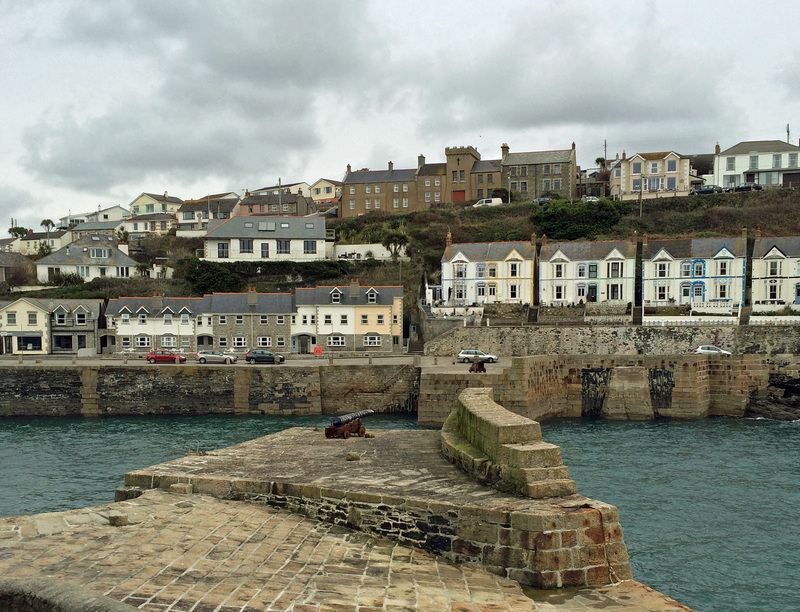 The small harbours are reminiscent of the North Yorkshire coast, similarly uninviting to sailing in bad weather with strong harbour defences. The coast took a real battering last year, with huge seas which did damage not seen in many, many years; you can see the brown vegetation, burnt by the salt spray, right up above the cliffs – the waves were enormous. 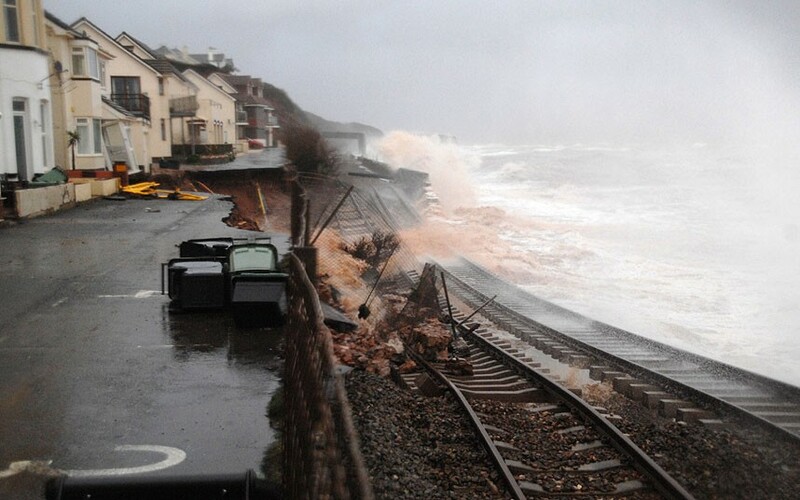 Dawlish suffered with the washing away of the railway, but all of Cornwall’s south coast was punished. 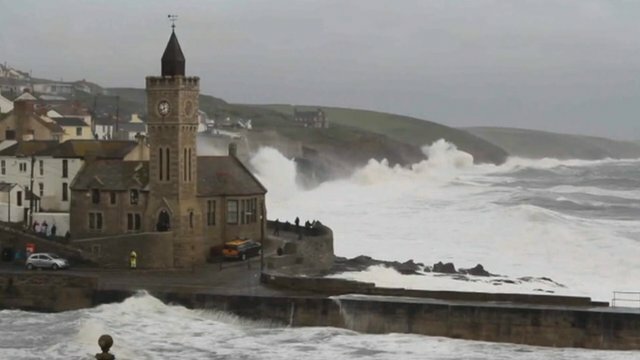 Porthleven suffered along with all the rest as an early recipient of the Atlantic storms, the waves pounding the coast and breaching the harbour defences. 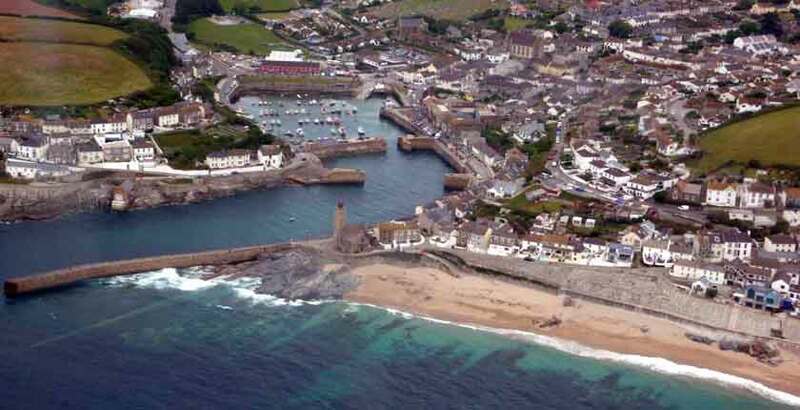 We remember first visiting Porthleven in the mid 1990s, seeing the memorial to two policemen on Panda patrol duty, who were swept into the harbour and drowned on 12th December 1978 when mountainous seas swept away the harbour road from end to end. 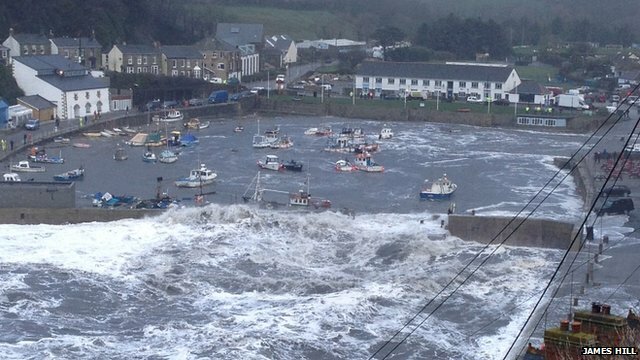 The latest severe storms, in early 2014, saw the boats in the inner harbour being winched to safety on to land, after the heavy wooden harbour gates were destroyed; there’s a fairly terrifying video on the Telegraph website. 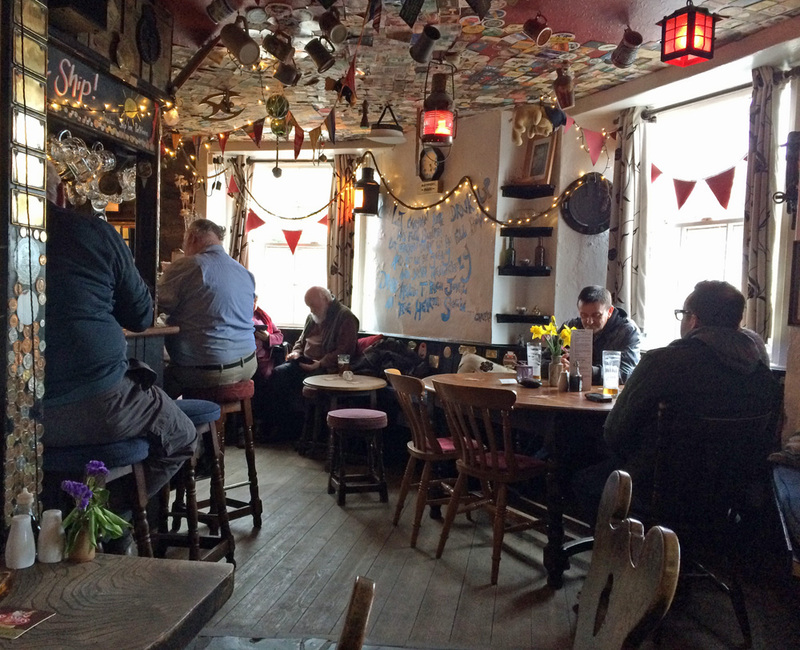 So, a hundred years ago we visited the Ship Inn for lunch. Back in those dark, far off days [well, 1994] children weren’t allowed in pubs in Cornwall, so we had to make do with the “family room”, a grim, cold bare room at the back where children couldn’t be seen, never mind heard. It was like that in many places, unwelcoming really. 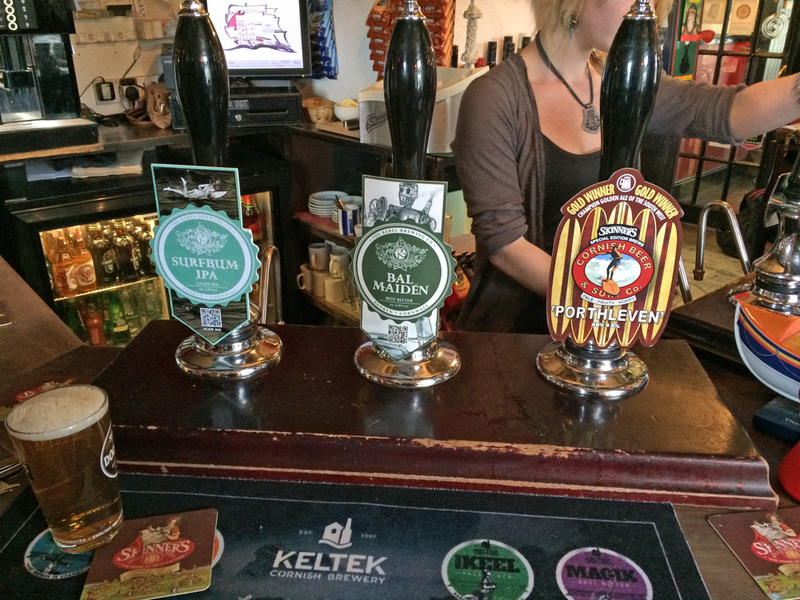 At this recent revisit, they would have been welcome [they are in their mid 30s mind] and happily tuck in to one or two of the good range of local beers on offer. Small children still confined “out the back”. 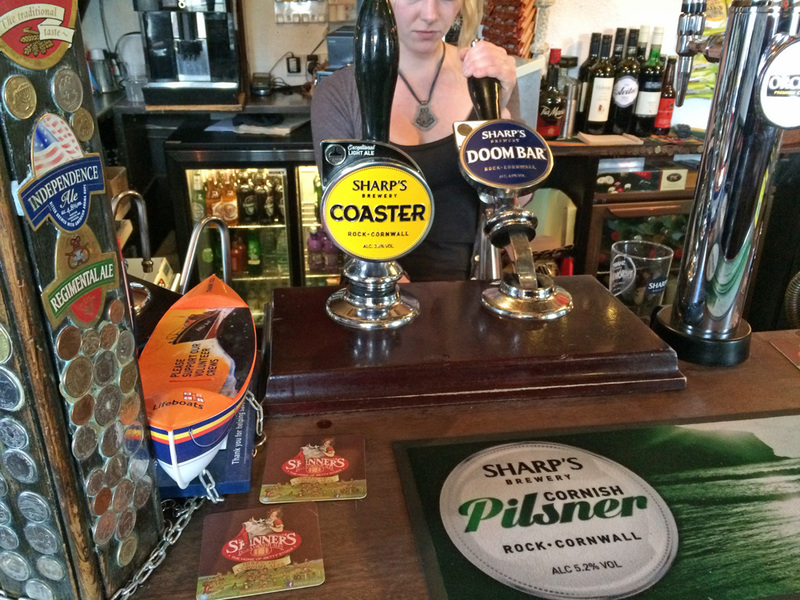 We tried the Sharp’s Doom Bar [4.0%] – very tasty. So there…just what we thought.